This quintet of young players look set for breakout years in the world of rugby. Nowell in action during last year's JWC final. The Exeter Chiefs youngster was one of the stars of the 2013 Junior World Championship in France, impressing on the wing and at fullback. Nowell’s reputation has only increased this season, thanks to his strong form for the Chiefs in the Premiership and Heineken Cup. 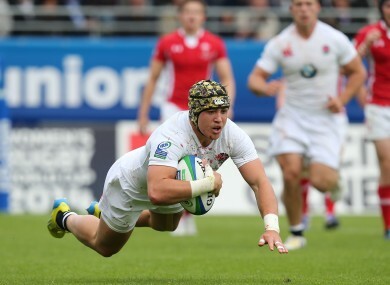 Still just 20, the England Saxons squad member looks set for full international honours in the future. At 5ft 11ins and barely 90kg, Nowell is diminutive by modern rugby standards, but his body is apparently made up of 100% fast-twitch muscle, such is his pace and power in contact. Brave and feisty, the Chiefs flyer constantly surprises with his ability to cope against bigger men. His keen understanding of space only adds to a thrilling attacking armoury. On the opposite end of the physical scale to Nowell is this South African freak of nature. The ever-growing lock made his Springboks debut in November, the start of what could be a legendary international career. Du Toit spent his formative years in the back row, giving him the incredible engine that carries his 6ft 7ins, 115kg bulk around the pitch so determinedly. Du Toit [left] sings the national anthem before his South Africa debut. David Davies/PA Archive/Press Association Images. The Sharks second row enjoyed his first full season of Super Rugby in 2013, starting eight games for the South African franchise and impressing with his power in the tight. While players like Nowell provide the flashy moments of inspiration, men like du Toit provide the possession for them to do so. If his upward learning curve continues, himself and Eben Etzebeth could be the next great lock pairing. Having come through the underage ranks at out-half, the 21-year-old spent 2013 playing with the number 12 on his back for the Western Force in Super Rugby. Godwin is a prime example of a playmaking first-five-eighth, creating chances for his outside backs, threatening the defence with his own running game and providing tactical direction too. The Zimbabwe-born back possesses one of the best ‘rugby brains’ that this author has seen. That means that he is incredibly effective at decision-making, be it in attack or defence. Constantly scanning the pitch, always aware of who or what is around him, and wonderfully communicative, Godwin is a definite Wallaby-to-be barring injury. His physical gifts make him a potentially world-class centre. Another small player, but again someone with abilities that more than make up for a lack of size. Kolbe was also a star of the 2013 JWC, where his side-stepping counter-attacking lit up South Africa’s play. His involvement in France was preceded by an excellent Vodacom Cup campaign for the Western Province, and followed by an even better Currie Cup with the franchise. Like Nowell, Kolbe is equally adept on the wing or at fullback, but his footwork is quite incomparable. Extensive involvement with the South African sevens team is both an indication and contributory factor to the 20-year-old’s attacking ability. At just 5ft 7ins and 80kg, there is every chance that opposition teams will look to physically dominate Kolbe, but he will feature in Super Rugby this year. France may not have realised themselves, but the hooking position has been something of a weakness for them in recent years. Dimitri Szarzewski is capable of superb one-off displays, but his physicality lacks consistency. The solution in the long-term looks to be Toulouse bulldozer Tolofua. A native of Wallis and Futuna, his 118kg mass has meant he has long been touted as a potential star. Tolofua on the charge for Toulouse. David Jones/PA Archive/Press Association Images. However, the 20-year-old has matured rapidly this season under the tutelage of William Servat in the ville rose. Tolofua is finally using his strength and size for more than the spectacular charges for which he made his name. His scrummaging has greatly improved, his mauling and rucking are technically more efficient and his defence is more disciplined. With his line-out throwing also getting better, he looks certain to add to the two France caps he won in 2012. Email “5 world rugby talents to watch out for in 2014 ”. Feedback on “5 world rugby talents to watch out for in 2014 ”.